Architectural Excellence is organized chronologically and serves as a visual lesson in architecture through the ages. The buildings featured come from all over the world and include centers of worship, public buildings, places of business and homes. 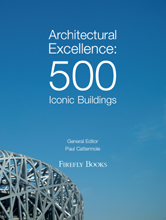 Each building includes a photograph, with a double-page spread for the top 50 selections. Captions provide specifications and brief histories.